This property is located on a quiet residential street in the delightful village of Konia. Only a few kilometres east of Paphos Town and the coast, many choose Konia for the traditional village life and convenient location. It’s a short and easy commuting distance to the amenities, and for those who are keen golfers, there are four excellent golf courses within a short drive away. Currently used as a permanent residence this spacious home features many home comforts including gas central heating, log burning fire and fabulous range cooker. The ground floor accommodation features a large open plan living room, superb family kitchen/diner, double size bedroom (currently utilised as a study) and a guest toilet with fitted shower. A useful storage cupboard is located under the stairs. ​The separate kitchen is large and features good quality solid oak fitted units, granite work surfaces, built-in wine rack and stylish cooker hood. Sliding patio doors provide easy access to the rear outdoor leisure space. A marble staircase with decorative ironwork balustrade leads up to the spacious master bedroom with en-suite, two further double bedrooms, plus a family bathroom with built-in vanity unit. A large L-shaped balcony with rear garden views can be accessed directly off the hallway and master bedroom. Bedrooms two and three each have access to a shared veranda which overlooks the village and coastline beyond. The garden to the rear is fully enclosed and features a central kidney shaped swimming pool with shrubs and trees surrounding, ideal for those with pets or small children. A wooden summer house provides a delightful shaded relaxation area and next to this is a side terrace with BBQ. To the front is a gated driveway with covered car port and enclosed landscaped garden including partially covered terrace. 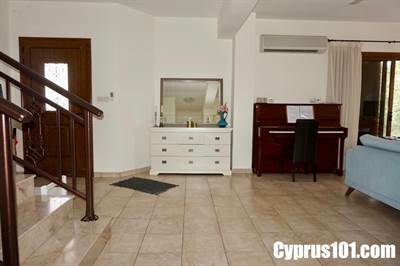 For those seeking a comfortable and spacious family home in a quiet residential setting within 5 minutes from all the amenities of Paphos, this property is a perfect option. There are full title deeds.